E.H. Schwab - Blog - Rolling a cone out of 14 gauge (.0781" thick) stainless steel sheet metal. E.H. Schwab Company recently had the opportunity to roll an order of 20 cones out of 14 GA (.0781" thick) stainless steel sheet metal. It was an exciting project for a new customer requiring coordination between the fiber laser department as well as the CNC rolling department and the seam welding/welding Department. As new challenges often do, this project required a bit of trial and error, but we were pleased with the end results of the rolled stainless steel cones and our customer was very satisfied as well. Do you have the need for a similar project? 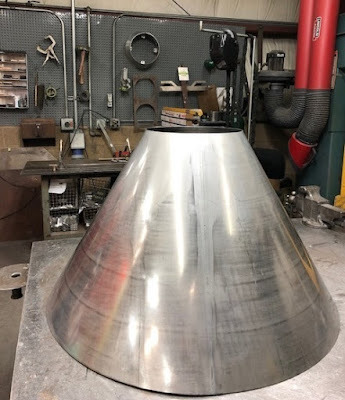 Please do not hesitate to contact us for a rolled and welded metal cone out of stainless steel, steel, aluminum, and even copper or brass. We welcome the opportunity to take on new and unique projects just like this one!